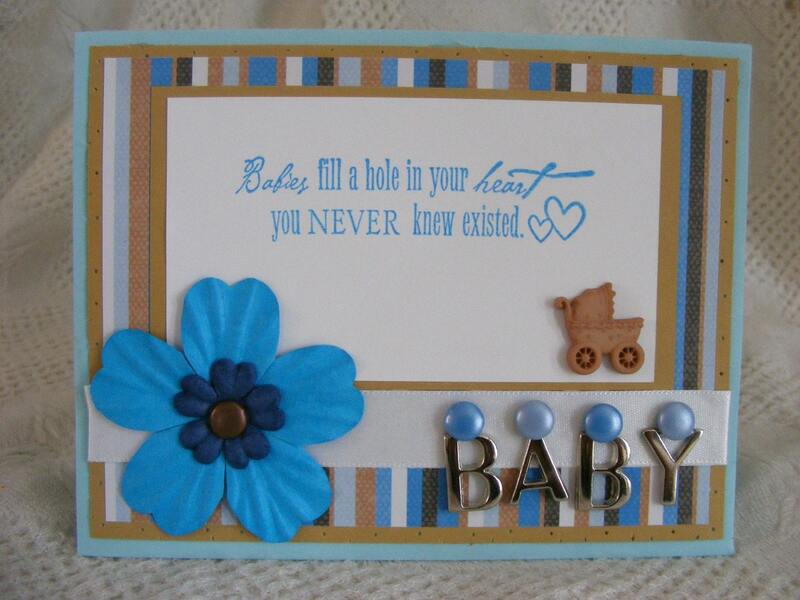 This little cutie would be a great card to give to someone who has just had a little baby boy or for a baby shower if they know they are having a boy. This card is made form cardstock and patterned paper (acid and lignen free) and embellished with lots of goodies including,white grosgrain ribbon, blue brads used to fasten silver letters spelling baby, a mulberry flower fastened by a copper brad, a brown baby carriage embellishment, and is stamped with a cloud 9 acrylic stamp reading "Babies fill a hole in your heart you never knew existed". I have left the inside of the card blank. The inside of the card is light blue. This card measures 4.25" x 5.5" and comes with a white envelope.